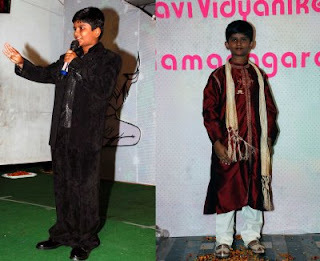 As usual the School Annual Anniversary “SAMBRAMA 2009” of Vasavi Vidyanikethan one of the prestigious schools of the town was a feat. The students dance performance to the famous film tunes as well as folk and devotional songs, decorative dias did give an experience of Tinsel World! 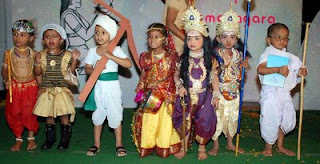 Fancy Dress presentation by Pre-Nursery Students of the school did draw attention of one and all. The crowd cheered up the tiny tots. LKG, UKG students also performed fearlessly on the stage. The huge crowd of students and parents of the Vasavi Vidyanikethan as well as other schools and general public gathered at the venue Kannika Mahal were up on their feet while the students of higher classes danced to the tunes of popular films! Sagar B.S and Kavya of 6th Standard who anchored the program was an added attraction.